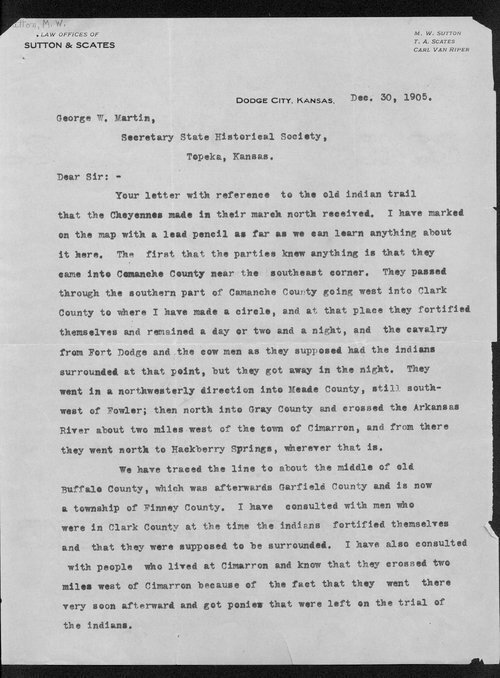 These letters were written to George Martin, Secretary of the Kansas State Historical Society, documenting the 1878 route of the Cheyenne Indians through Kansas. Some of the letters include county maps where the writers marked the route. Letters were written by M. W. (Mike) Sutton from Dodge City; R. M. Wright, Dodge City; J. W. McNeal, Guthrie, Oklahoma; C. F. Colcord, Oklahoma City, Oklahoma; Geo. L. Kious,Selden, Kansas; J. D. Greason, Atwood, Kansas; C. P. Lynn, Ness City, Kansas; and Hill P. Wilson, Topeka, Kansas. Most of the letters pertain to the events and/or route through one or two counties known to the specific author. Counties mentioned include Barber, Buffalo (now part of Finney), Clark, Comanche, Decatur, Foote / Gray, Gove, Lane, Meade, Rawlins, and Sheridan. County maps exist for Clark, Comanche, Decatur, Gove, Meade, Rawlins, and Sheridan plus a state map. It is not clear who added the information to the maps. This collection of correspondence was digitized with funds donated by the Shears/Hubbard families in memory of William Chalfant.